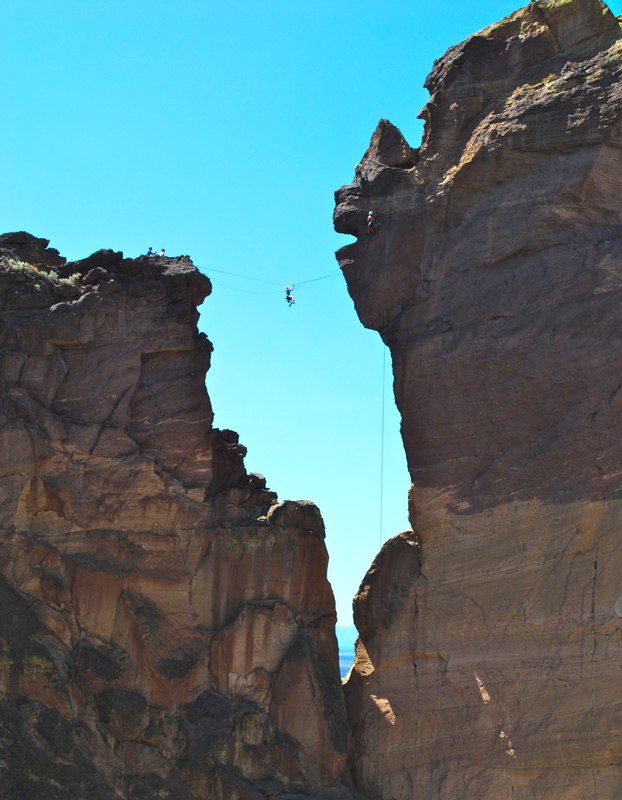 We took our annual camping trip to Crooked River last summer and included a day of exploring Smith Rock State Park. After strolling down to the river from the parking area, we determined that hiking Misery Ridge was the big adventure of choice for us…it was steep, dusty, hot, and held the promise of sweeping photo-worthy vistas at the top. Onward and upward. We made the summit and caught our breath, wiped the sweat off our faces, and started round the other side of the cliffs. It was only a matter of a couple switchbacks before we came upon this sight: fragile human beings doing the unfathomable. This is Monkey Face – a 350 foot pillar that overhangs on all sides – and an experienced climber’s delight. Just watching them from below scared the crap out of me. Virginia was mesmerized; I was nauseated and Sarah was gleefully declaring that she wanted to try THAT! From those crossing the tightrope suspended line like wee spiders to those rappelling down the vertical sides, these folks were in their element: focused, intentional, adrenaline pumping fun. It makes no sense to me, but I am awed by the joyful reckless bravery that we find within ourselves from time to time – and how we choose to express it. 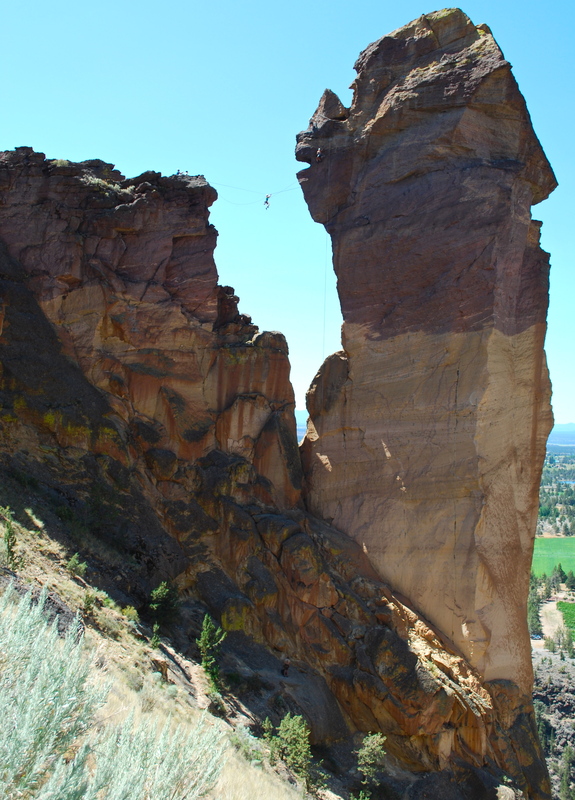 This entry was posted in Siftings and Essays of the Heart, Through My Lens and tagged Adventure, Crooked River, Family, Monkey Face Pillar, Oregon, Smith Rock State Park, Travel. Bookmark the permalink.